Enrollment and money and everything is almost completely straightened out at school, finally. I discovered that one serious delay was caused by someone in the admissions office: apparently they wanted to keep track of all former Canterbury students who were now at Otago, so they classified them all as being enrolled in "certificates of proficiency" - a one-semester non-degree piece of crap no one ever seeks. And since you can't get a visa with a "CoP", New Zealand Immigration kicked back a bunch of visa applications and slowed everything up. It's made worse by the fact that they were processing a bunch of month-old applications that had been abandoned in Christchurch after the quake. But all sorted, and all good. Lizzie's visa should follow, in much less time. In the meantime, I've been in my classes and having a good time. I posted about my classes in general before, but since I've gotten some questions about Old English I thought it might be worth discussing it a little more in-depth. Old English is not what a lot of people think. It's not Shakespeare ("Five talents is his debt, His means most short, his creditors most strait.") 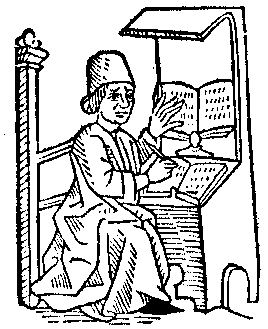 or Chaucer ("Whan that Aprill, with his shoures soote The droghte of March hath perced to the roote And bathed every veyne in swich licour"). Those are written in Early Modern and Middle English, respectively - the structure is pretty much the same as modern English, since it comes pretty much from the time after 1066 when the Normans invaded England and started the mix of Norman French with Anglo-Saxon, which was the last major shift in the language (relatively speaking). Old English instead looks very much like a foreign language to English. Heavily influenced by German, it is partially inflected - that is, it retains case endings to words that indicate their function. This means that word order can be messed with, moving verbs and subjects and objects all around, without too greatly affecting meaning. I took Latin for years. It's a fully inflected language, with hundreds of case endings, so I am familiar with the whole deal and the terminology (nominative, genitive, etc.). But somewhat disconcertingly, Old English is not fully inflected - it's only inflected by about half, sitting somewhere in the middle of the two ways of doing things. While this makes it easier in some respects (much less memorization) it also means that it can be enormously tricky, since there are all the hassles of a inflected language to learn but also countless exceptions and uninflected rules to tease out. For example, Latin has case endings for verbs to indicate tense. If you want to say "I will sing," then you just use the base stem for "sing" and add the appropriate future ending. Done. But Old English has only past and present tense endings: they dropped the future endings altogether. Confusingly, though, they haven't quite worked their way around to the Middle and modern English way of indicating the future tense ("will"). Instead, they have a couple of half-measures. Some of the time, you use a form of "willan", the ancestor of our "will". Sometimes, you use subjunctive phrasing. And sometimes, you just have to guess what is meant because there's no way to tell. "I will eat" can be written identically to "I eat" without breaking any grammatical or usage rules. What a headache! Adding to the mix are a few other choice oddities, like the addition of the symbols "þ" and "ð", which sound identical when spoken. Fortunately, there's also a lot that's easy about the language. 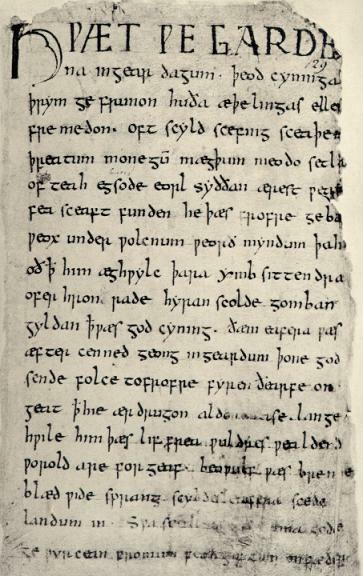 An enormous amount of common modern words have descended from Old English counterparts, even if the spelling is different. "Mistag" may look opaque at first, until you learn the rules of pronunciation and find out that the "g" is more like a "y" sound. Then its meaning of "misty" makes more sense! In my class this year, we are learning essentially the whole of the language, until by the end we are able to translate it live and consider the merits of interpretation and allusions. 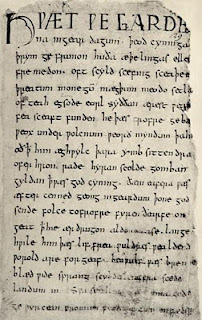 With few exceptions, our text is Beowulf, the ancient epic poem. Grendel gongan, godes yrre bær. And here's this segment (and more) being read aloud by Benjamin Bagby, a modern performer who attempts to re-enact the experience of listening to Beowulf, as a contemporary of the poem would have heard it. He's a little goofy, but it's interesting to listen to.